Hanneke Faber is President of Unilever Europe and a member of the Unilever Leadership Executive. She has spent most of her career in the FMCG and retail industry. We asked her about the future of brand activism. You have said that “brand builders need to take a stance, to create movements, to evangelize and even sacrifice.” Can you explain what you mean? I think it’s really important that brands do three things to win, and I always use Ben & Jerry’s as the example to illustrate those three things. At Unilever, they are our most purposeful, activist brand. They stand up for democracy, refugees, and fair trade. Peace building. Cleaning up the politics of influence. Equality for everyone, everywhere – from racial justice to marriage equality. The second thing a brand needs to do is to link that purpose to locally relevant issues that reflect the times. Twenty-five years ago, when Unilever bought them, peace, love & ice-cream meant something different. 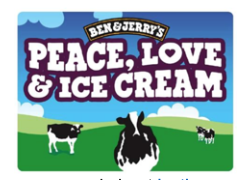 Today, peace, love and ice-cream means “Pecan Resist” which calls for peaceful resistance against the Trump administration’s “regressive and discriminatory policies” targeting minority groups, women, people of color, LGBTQ people, refugees, and immigrants. It’s all about inclusivity, no walls, etc. Pecan Resist supports four organizations that are working on the front lines of the peaceful resistance: Color of Change, Women’s March, Neta, and Honor the Earth. They’ve executed against their purpose in very different ways around the world. Local relevance is critical. In Germany there’s also a refugee issue, not around a wall, but it followed Angela Merkel’s “wir schaffen das” statement– which means we’ll get it done. 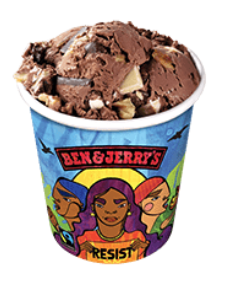 Ben & Jerry’s is present at pro-immigration rallies – being very visible in the refugee debate. The third point is that the brand must talk about it. You can’t have a great purpose and do great things and then use old-fashioned TV advertising. So what Ben & Jerry’s does is spend virtually all of its ad marketing money on activism – in events, in packaging, and in the store. All their money is spent on activism – on bringing their purpose to life. They do and then they communicate. Has this been successful? Ben & Jerry’s has enjoyed many years of double-digit growth here in Europe. I’m just trying to bring this on to more of our brands. Most of our brands had a purpose once upon a time when they started, but over time they’ve lost some of it. 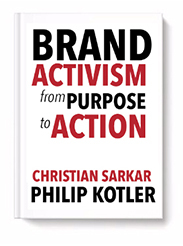 How did you become a brand activist? I grew up as a marketeer at Procter and Gamble – where it was all about superior product benefits. Tide washes whiter, and Pantene makes your hair shinier. That is important, but it’s no longer sufficient in a time where there’s so much competition. Now you need people to love you not only for what you deliver, but also who you are. Just providing great ice-cream is not enough. Unilever has given me the license to be much more activist on individual brands. From my own upbringing, my Dad led the massive European anti-nuclear movement in the 1970’s and 80s, galvanizing almost 500,000 citizens to demonstrate in Amsterdam and London. He was a role-model. He also fought for human rights in Eastern Europe. I saw how activism can rally people and create a movement. What do you say to critics who may feel that “purpose” is simply another marketing gimmick? I will say you can’t invent a purpose for a brand. You have to go back to the origin of the brand and ask where did it come from? What was the intent of the founder? The founders are critical. And then, you need to make that brand purpose relevant for today. We have brands which are over a hundred years old. So can a brand wake up? The purpose of the brand will stay the same from when it was founded. But the local issue of today is likely to be rather different from a hundred years ago. A hundred years ago, Lord Lever was interested in hygiene – so children wouldn’t die. Today, in the western world, the opposite may be true. Kids don’t get dirty anymore, because they spend all their time playing on a screen. So now our job might be to encourage kids to get dirty, to go out and play, and yes, we’ll help you clean up after. Dirt is good. How can a brand purpose be brought to light? What about the point of historian Rutger Bregman at Davos – who said that the rich just need to pay taxes, instead of avoiding them? Well, he’s right. We absolutely pay our fair share of taxes here in Europe. I think this is super important, because otherwise your ‘say-do’ gap become very high. If you’re a tax dodger, you can’t be serious about purpose. And how do you feel about lobbying? I don’t think lobbying has to be a bad thing. At Unilever, we work with governments and NGOs to deliver on our company purpose (‘to make sustainable business commonplace’) together. To make real change, companies need partners. But the tobacco industry lobbying, for example, that’s another story. I’ve been lobbying in Brussels about plastics; as an industry, we produce a lot of plastic, and as Unilever, have committed that by 2025 all our plastics will be 100% recyclable, and we’ll move to at least 25% recycled plastic. But I would like to see incentives for all companies to be doing this. So, governments can play a role in helping companies do the right thing. A lot of the plastic that’s polluting the ocean comes from the single-use plastic sachetsthat were supposed to make products affordable for the base of the pyramid. Yes. Single-use plastic sachets allow low-income consumers in developing countries to buy small amounts of quality products that would otherwise be unaffordable to them. These products tend to provide hygiene or nutrition benefits. The problem is, these multi-layer flexible sachets are not currently recycled and have little or no economic value, so they leak into the environment. We have invested in a new CreaSolv pilot plant in Indonesia, designed to recover polyethylene (PE), which accounts for more than 60% of the layers. We use this to produce high-quality polymers, which are then made into new sachets. Having proved the technology, we’re now starting discussions with investors and other interested parties to develop a commercial plant. Our industry has been a polluter, and we need to urgently take action, and be at the forefront of reducing that pollution. We have to be very careful that we do things for the common good, and not just what’s good for our industry. So we want to collaborate with partners and governments to help them encourage businesses to clean up their act. Are you planning on moving your offices to higher ground in the Netherlands, especially? How do you manage the balance between economic performance and social good? Are they mutually exclusive? We don’t see it as a balance. Purpose and profits are not opposed to each other. We believe more purpose leads to more profit. They are intricately linked. Companies with purpose last longer. Unilever has been around over a hundred years, and we want to be around for another hundred plus. Brands with purpose grow faster than other brands. We have plenty of internal evidence of that. 70% of our growth comes from brands that we define as purposeful. The purpose-brands have grown 46% faster than the other brands over the past three years. Our total shareholder return for the past 10 years has been really strong. Finally, we also find that when our people can link their personal activism to the company’s purpose, they are more engaged, more committed, do a better job, and stay the course. We attract the best people in the market – we’re the no. 1 employer of choice in our industry in 44 countries around the world. We’ve also saved money through waste and energy reduction. We have to disconnect growth from our environmental footprint. They don’t have to go up at the same rate. We have less risk – because we have more sustainable sourcing. We have less risk socially because of our commitment to human rights through the entire supply chain. We don’t see a trade-off, and if there is, we know it’s temporary. We look for savings in other places in order to do the right thing, and we believe our customers will respond. What do you see for the future of Brand Activism? I think for the planet and for society, I hope it is the future. I don’t think it’s going to be easy for every brand. In our Unilever portfolio, we recently acquired a brand called the Vegetarian Butcher. Its purpose is to free animals from the food chainby offering a complete and delicious alternative to meat. They’ve done really well here in Holland. Will the world go vegan by 2050? It may well be one of the most important things we can do as citizens to fight climate change.